Walking into the gardens of The Zanzibar School during a first grade recorder lesson can be quite amusing. One might ask “What is that strange discordant sound coming from this beautiful old building?” Actually, entering the first grade classroom during these sessions, when their teacher gives the children free time for self practice, can be absolutely ear-splitting. Finally, after much screeching and blowing, the children will come together and manage a few short notes in harmony. 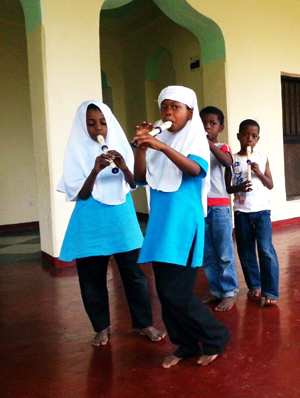 At the Creative Education Foundation of Zanzibar (CEFZ) The Zanzibar School has not had recorder lessons for very long, but are very glad they are finally underway. 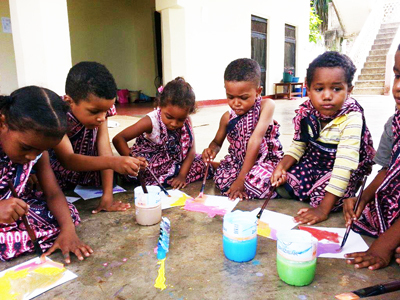 Recorders are not available here in Zanzibar, but are a necessary part of our Steiner Waldorf curriculum – important for left and right brain learning, finger dexterity and co-ordination, not to mention the pure enjoyment for a child of making sound. Since being listed on Pack for a Purpose a few months ago, where we listed a need for recorders and other essential school supplies, socially responsible travellers have donated over 20 recorders. They also brought soccer balls, a net ball, craft supplies, and the school is now all stocked up for the next year’s supply of pencils and pens. Small things; Big impact. These items are not available in Zanzibar at all, and if they are, such as soccer balls, they are of very poor quality and last about a week. A sheer lack of funds in the school is also a barrier to providing these nice little extras for our students. Zanzibar is the quintessential tropical holiday destination, with long, white, palm fringed beaches, but few tourists get to scratch the surface of our community. With the average wage at around $1 a day, there is little alternative for low income families to have access to education outside over-crowded government schools – serious over-crowding can mean 140 children per class. With little individual help at school, and likely uneducated parents, children from disadvantaged backgrounds have little chance of breaking the cycle of academic failure. 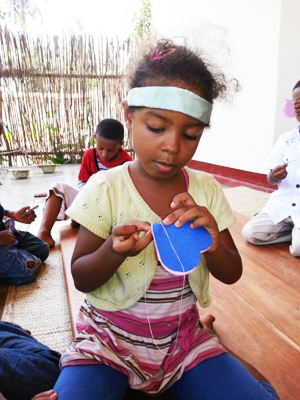 CEFZ The Zanzibar School is a project with a mission to provide free or subsidized quality education using the Steiner Waldorf model to children who would never have a chance of such education, whilst building the capacities of local teachers. Our first grade recorder lessons are set to continue, and our students are on the path towards group harmony. With generous donations from PfaP travelers, we are very likely to have enough new recorders when we add a new grade class and steadily grow in January 2014.